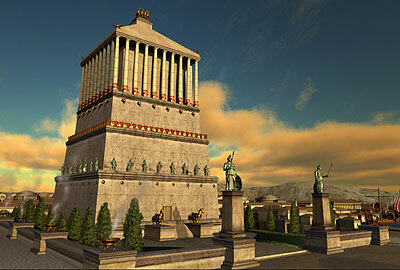 The Mausoleum at Halicarnassus served as the burial tomb for King Mausolus. The King married his sister Artemisia. After the King passed away, Artemisia ordered the building of the tomb in his memory. Mausolus was the son of Hecatomnus who ruled the Mediterranen coast of Asia minor with a small kingdom. Mausolus continued with the expansion of the kingdom after the demise of his father. Though he was not an illustrious ruler like his father, nevertheless he ruled the kingdom for 24 long years, with Halicarnassus as his capital. The only thing worthy of any notice during his pretty long tenure was the exquisite mausoleum built in his honor and which earned a place among the seven wonders of the world. after her husband King Mausolus. She was buried along side him in the Mausoleum of Halicarnassus. The tomb wasn't quite finished when Queen Artemisia died. The builders decided to finish the building project because, according to the Roman historian Pliny, the tomb was not just a memorial to the royal couple, but also to the sculptor's art. This mausoleum was built around 353 BC. The stucture stood strong for 16 centuries till an earthquake damaged the colonnade and the roof of this structure. In the early 15th century AD, Knights of John of Malta, used the stone blocks in this structure to construct a castle. That was how one of the seven wonders of the world came to an end. The city of Halicarnassus is now named Bodrum. Bodrum is now a major vacation destination. Its most popular attraction, though, is not the Mausoleum at Halicarnnasus ruins but rather the crusader castle that is partially made from the tomb ruins.